Condie writes in a very poetic and lyrical way. This first is very apparent in Matched (the first in the series). She uses various poetry seen in classical literature throughout her novels such as Do Not Go Gentle by Dylan Thomas, Crossing the Bar by Sir Alfred Tennyson, and even a few poems by Emily Dickinson. In my opinion, she seems to embody the poetry she uses in her novels, most especially the Do Not Go Gentle poem. It reminds her not just blindly and ignorantly give in to what society demands of her. While that is the main poem for Matched, Tennyson’s poem,Crossing the Bar, is all for Crossed. It is plainly seen through her crossing of the Canyon. For her writing style, not only is she poetic, she is also a more emotionally based writer. Her main focus is on her characters, their feelings, and their thought processes. Though Condie still retains that kind of writing in Crossed, she also adds a more plot-driven facet to this novel. Cassia is in a constant state of motion, going to the verge of society and through the Canyon. This alone adds a more of a plot-based adventure to her writing. I personally think she did a very good job. I liked Crossed better than Matched for specifically this reason. In Crossed, Condie paints a very good and clear picture of who her characters are; however, she still leaves room for a small amount of mystery to every character. Though you feel you know the three main characters (Cassia, Ky, and Xander) very well, you never know them fully ever until Condie shows you. This provides many instances where plot twists will take you by wonderful surprise. In Crossed, you learn more things about Ky, his character and background, and reasoning, yet you learn that much more about Xander even though he is not in the bulk of the novel. For those of you who have read Matched, you know that the class and working structure of the society is very different. It’s very organized, food is rationed at the optimal sizes per each person, school and knowledge and recreation is divvied up so that the society runs at its best. Each person is given a job based on their abilities and depending on how well you do in a job or what actions you take that negates the efficiency of the society, you are labeled. The undesirables are moved to the outer provinces to work in terrible, war-torn positions. I believe this is a commentary on our society as well. Commercialism and Capitalism are a big part of our society today, and the only way they can survive is to do just what the society found in theMatched series does, albeit a little more subtle and not nearly as drastic. This alone has made the entire series thought provoking. I read this book in a matter of days. I found that it was the best in the entire series. I felt Reached fell short and was anticlimactic; whereas,Matched was too slow-paced for me. 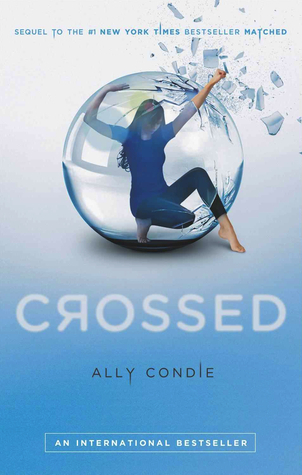 I found that Crossed was definitely the best fit for me between the three. The Rising, which is the rebellion force that Ky and Cassia are desiring to find is not exactly what you would picture a rebellion to be. Like the society, it is also very organized. It’s very different, yet oddly similar to what you would find in other dystopias such as The Hunger Games; however, note that this series is NOT like The Hunger Games. This book is more PG than anything written in The Hunger Games. Actually, that is a very good description of this entire series: The Matched series is a dystopian series for children.